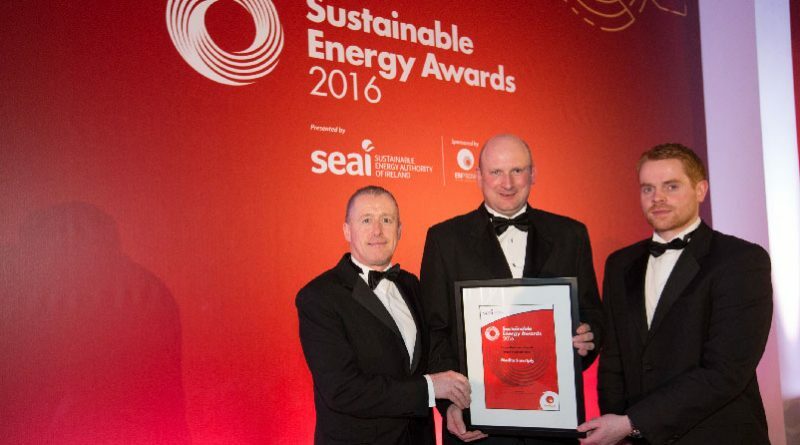 MEDITE SMARTPLY has been highly commended at the Sustainable Energy Awards 2016 in the large energy category. The event, which took place on the 3rd November 2016, brings together leading innovators and companies that demonstrate a proven track record of going beyond best practice in integrated energy management. This award, in part, is a result of the MEDITE SMARTPLY Operation Excellence programme that began in 2014. The programme initiatives consisted of product and process flow optimisation, variable speed drive monitoring, controls, lighting, ISO 50001 certification, electric transport, and a steam turbine generating onsite electricity driven by their own biomass steam boiler. The company has also undertaken employee awareness initiatives including displaying energy targets in real time at operator stations, children’s Energy Calendar competition and an Energy Fun Day. The company has systematically and effectively focused resources on opportunities for energy reduction saving the company in excess of €250,000/per annum in energy costs. “This award is an independent external acknowledgement of the hard work and efforts that all of our teams across Europe have put in from day one. From our new technologies, such as our Mat Preheater, compressed air energy reduction and process pumps upgrades, to our engineering works on LED lighting and airflow optimisation, everyone has had a part to play,” comments Pat Beardmore, Operations Director. The company has set its sights on achieving an energy reduction in excess of 10% in the coming years. With five projects already in planning in order to achieve these ambitious goals MEDITE SMARTPLY will continue to lead the way in energy management in its sector.